Getting email of a build failure is a common use case in Jenkins. We would want to get notified whenever any build fails and when it is back to success. 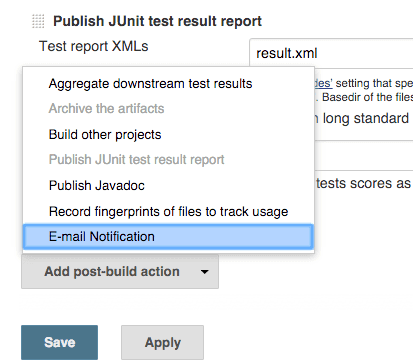 Here are steps to setup email on build failure in Jenkins. This tutorial requires Jenkins setup on Ubuntu Linux with a py.test project and publish junit reports post build action. First create a test python test case which always fails. Create test_fail.py with following content. assert 1 == 2, "This is expected to fail"
>     assert 1 == 2, "This is expected to fail"
Create a test py.test test project and name it test_fail (refer to Jenkins setup tutorial). 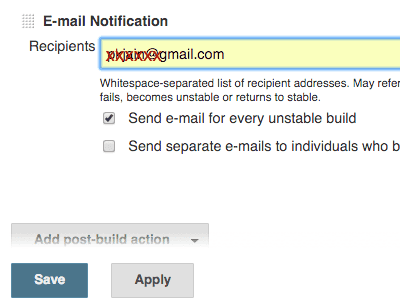 Enter one or more emails (separated by space) as shown below and select send email on every unstable build. Click on Save. Setup Jenkins from email if not done already. Go to Manage Jenkins > Configure System. Then in section “Jenkins Location” enter a suitable system admin email. Notifications will come from this email address.